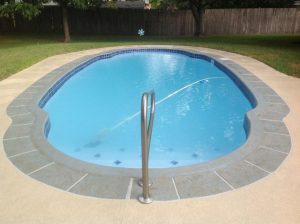 Arlington homeowners know that swimming pools and hot tubs need regular maintenance and we’re proud that so many turn to Texas Fiberglass Pools Inc. for all their fiberglass pool resurfacing, Arlington fiberglass pool repair, and pool maintenance needs. We’ve worked hard to earn our reputation as a leading provider of quality commercial and residential pool repair services for the entire Dallas-Fort Worth Metroplex. At Texas Fiberglass Pools Inc. we’re equipped to take on all of your swimming pool, hot tub, or deck resurfacing needs so that you can enjoy all the benefits of a well-maintained pool while saving yourself thousands of dollars in the process. We offer a range of services that can enhance your pool area too, from deck resurfacing to additions like waterfalls and fountains. We also provide baptistery resurfacing as well as pool plumbing installations and repairs. Our fiberglass resurfacing services are recommended for units constructed of ground gunite, concrete, or block and fiberglass walled with concrete bottoms. People commonly use a vinyl, concrete and paint, or concrete and plaster renovation; but these materials are cheap, require more maintenance, and wear out faster than fiberglass. Fiberglass coated pools are able to handle all the angles; steps, curves, and other features within a pool or hot tub are easily coated by fiberglass. Compared to other resurfacing materials, the fiberglass pool resurfacing that we offer through Texas Fiberglass Pools Inc. will hold up for more years of use and require less maintenance. Arlington pool owners who want the true experience of having a great outdoor space will find that our Arlington deck resurfacing services are as extravagant as they are affordable. We offer a large selection of materials for deck resurfacing, in a wide variety of colors and styles, for creating the one-of-a-kind look you desire. Our Dallas-based deck resurfacing professionals offer expert knowledge and advice on coatings, design, and materials that will provide the most pleasing and long-lasting results. Whether you want to improve the style and functionality of your swimming pool with new tile or copings or you need a timely repair for a leaking hot tub, our team of skilled contractors can handle any job, big or small. We provide free written estimates before starting any project and guarantee that you’ll be pleased with the results. Contact us today to see how we can make your backyard dreams come true!